Los Campesinos! are a seven-piece indie pop band from Cardiff, Wales, formed in early 2006 at Cardiff University. Though the band formed in Wales, none of the members are Welsh. The band has gone through several lineup changes during their career, with their current lineup consisting of Gareth Campesinos! (lead vocals, lyrics), Neil Campesinos! (guitar), Tom Campesinos! (guitar), Rob Campesinos! (guitar, other instruments), Kim Campesinos! (keyboards, vocals), Matt Campesinos! (bass) and Jason Campesinos! (drums). Gareth, Neil and Tom are the only remaining original members still in the band. The band released their debut album, Hold on Now, Youngster..., in February 2008 and followed this up by releasing their second album, We Are Beautiful, We Are Doomed, in October that year. The band had previously referred to this release as a 'record' or an 'extended EP', before ultimately deciding to refer to it as their second album out of simplicity. Their third album, entitled Romance Is Boring, was released on 1 February 2010. Their fourth full-length release, Hello Sadness, was released on 14 November 2011. The band's fifth album, No Blues, was released on 29 October 2013. Their sixth, Sick Scenes, was released on 24 February 2017. The group came together at Cardiff University in 2006, originally consisting of Neil Turner on guitar, Ellen Waddell on bass guitar, and Ollie Briggs on drums. In March 2006, Tom Bromley joined the band, assuming the role of lead guitarist, later followed by Gareth David Paisey – who became the band's principal lyricist – on lead vocals and glockenspiel, Harriet Coleman on violin and keyboard, and finally Aleksandra Berditchevskaia on vocals, keyboards and melodica. According to Tom, he met Neil after overhearing him discussing Sufjan Stevens at a club. The band's earliest compositions were long pieces in the style of post-rock, though no recordings from this era are known to circulate publicly. The word campesino in Spanish translates to "peasant" or "country person". All members of the band refer to their surnames as "Campesinos!" 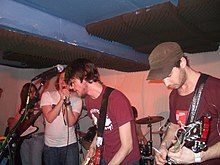 The band performed their first gig on 8 May 2006 at a student union club night; they went on to play a number of increasingly well-received gigs around Cardiff. An early demo was recorded featuring the songs "Death To Los Campesinos! ", "It Started With A Mixx", "Sweet Dreams Sweet Cheeks", and "You! Me! Dancing!". The songs were posted on the internet, bolstering the popularity established by their energetic live shows and earning them airplay on Huw Stephens's evening show on BBC Radio 1 Wales. The band's reputation continued to grow, and in August 2006 landed them a slot supporting Canadian supergroup Broken Social Scene. In November 2006, the band were signed by Wichita Recordings. Wichita released their first single on 26 February 2007, a double A-side featuring new songs "We Throw Parties, You Throw Knives" and "Don’t Tell Me To Do The Math(s)". In April the band signed to Canadian label Arts & Crafts for North American releases. In June 2007 the band released "You! Me! Dancing!" on limited edition 7" coloured vinyl, which later went on to feature in an advertisement for Budweiser. This release was accompanied by a handful of live performances in Bath, Newport, Cardiff and London. Around this time they were seen playing with bands like Sky Larkin and Johnny Foreigner. Both singles, produced by Broken Social Scene collaborator Dave Newfeld, were released in North America on Sticking Fingers Into Sockets, a compilation album released on 3 July on Arts & Crafts. The band embarked on their first full UK tour in October 2007, following the release of "The International Tweexcore Underground" on 15 October. Their debut album, Hold on Now, Youngster..., was released in the UK on 25 February 2008 and in North America on 1 April 2008. They also embarked on a European and North American tour in support of the album. The NME rated the album 6/10, praising its musicality but criticising its cohesiveness, but other sources, such as Pitchfork Media and Drowned in Sound, lauded it. They made their TV début on Tubridy Tonight on 9 February 2008. Two weeks after the release of the album, Harriet appeared on Blood Red Shoes' debut album Box of Secrets, contributing violin on the track "Hope You’re Holding Up". On 1 August 2008, the band announced that a record titled We Are Beautiful, We Are Doomed would be released before the end of the year, and the date later confirmed for this was 13 October, although that was later pushed back to 27 October 2008. The band explained: "This is no post-album cash in. It’s no B-Sides and rarities or 'songs that weren’t good enough to be on the album cobbled together with some remixes and field recordings of Cardiff's indie scene'; it’s ten all-new tracks that none of you have ever heard before." No singles were released from the record, and its distribution was limited. In October 2008, the band performed around England, headlining the Shred Yr Face tour with support from No Age and Times New Viking. In April 2009, the band played in Argentina, Colombia and Venezuela, their first performances in South America. Los Campesinos! recorded their third album Romance Is Boring in Stamford, Connecticut, with John Goodmanson. It was recorded in multiple sessions, with the second half of a North American tour in-between. In May 2009 it was announced on their blog that they had almost finished recording the album and that it was to be mixed in Wales in June. Two song titles were announced: "This Is a Flag. There Is No Wind" and "Straight in at 101". On 2 June 2009 it was announced via their website that backing vocalist Aleks planned to leave the band and return to her studies after a US tour in August. On 24 June, they announced on their blog that the album was complete. During 2009, the band toured with Rob Taylor, a musician who performs under the name of Sparky Deathcap. Rob has since become the official eighth member of the band during live shows, performing additional guitars, keyboards, percussion, and glockenspiel. On 9 September 2009, the band released a song called "The Sea Is a Good Place to Think of the Future" as a free download. A video was also made for the song, directed by the band's bassist Ellen Campesinos!. The band formally announced that Gareth's sister Kim would be replacing Aleks as the band's keyboardist and vocalist. The band premiered their new single, "There Are Listed Buildings", on their website a week later. On 25 October, they announced the name, track list and release date for Romance Is Boring. The band's second official album, Romance Is Boring was released on 1 February 2010. The title track was released as the second single from the album two weeks later to coincide with an extensive UK tour. The band had to cancel their performance at the Culture Shock festival on the campus of SUNY Purchase and the first two dates on their 2010 US tour, as they were unable to get out of Britain due to the air travel delays from the aftermath of the 2010 eruptions of Icelandic volcano Eyjafjallajökull. The band made their American network television debut on Last Call with Carson Daly, in which they performed "Romance Is Boring", pre-recorded from their show at the El Rey Theatre in Los Angeles in May 2010. In June, Ollie announced that he had left the band. Four days later, the band explained that all summer dates would continue as scheduled. Just over two weeks after the departure, it was announced that the band would release a new EP entitled All's Well That Ends on 19 July 2010. This is the first release to feature Rob Campesinos! and features reworkings of four songs featured on Romance Is Boring. In July, the band played a show in London for Wichita's tenth anniversary with new drummer Jason Adelinia. He had been the band's road manager and merchandise seller since 2007, and was previously a member of The Ghost Frequency and The Pipettes' backing group, The Cassettes. They later posted through Twitter an image entitled 'The band Los Campesinos!' with both Rob and Jason present, suggesting both had become full-time members of the band. An episode of the Craig Cash sitcom After Hours is called Romance is Boring and the album's title song features in a montage starring actress Jaime Winstone. On 9 December 2010, the band announced the launch of a quarterly magazine, Heat Rash, and released a new Christmas song, "Kindle a Flame in Her Heart" as a free download through SoundCloud. Each Heat Rash release included a magazine, a limited edition 7" vinyl record, and downloads of new music. The first Heat Rash release included tracks "Light Leaves, Dark Sees" and "Four Seasons". The band also announced that they were working on their fourth studio album, and third album to be recorded with John Goodmanson, in Barcelona during April 2011. Gareth also announced that he would be working on a side-project with Zac Pennington of Parenthetical Girls and Freddy Rupert of Former Ghosts under the name Crying. They announced at the beginning of May 2011 that the recording of the album had finished. In an interview with online music website, Skiddle.com, frontman Gareth confirmed that the album would have a more direct and pop orientated sound. Harriet, the band's violinist, left the band on amicable terms in September 2011 to continue her studies. Hello Sadness was released on 14 November 2011 in Europe and 15 November 2011 in the United States. "By Your Hand", the first single release from the album, was released as a free download on the band's website on 8 September 2011. The band followed this with releasing single "Hello Sadness", on 12 October 2011, a month before the album of the same name. During November 2011, the band played several tour dates, across the UK, the US and two dates in Japan. Tour dates in the United States, United Kingdom and Europe were also played in early 2012, and the band performed their single "By Your Hand" on the Late Show with David Letterman on 20 January 2012. In March 2012, it was announced that Gareth would be performing as a part of Paul Heaton's performance piece The 8th for six performances during the summer of 2012. The band continued extensively touring, including an appearance on the Main Stage of the Reading and Leeds Festivals, and a headline-spot on the Lake Stage of Latitude Festival. In May 2012, they released a new song, "Tiptoe Through The True Bits" on their official blog. The song was previously recorded as part of the sessions for Hello Sadness, however was not included from the album after the band decided it wasn't in-keeping with the rest of the album. In an interview with the NME, frontman Gareth also confirmed that they would begin work on their fifth album in early 2013. On 7 December 2012, founding member Ellen announced she would be leaving the band following their show of 15 December at London's Islington Assembly Hall. She gave her reason for leaving, in a lengthy blog post, as wanting to "try something new". Ellen's final show also featured former member Aleksandra providing guest vocals during the encore. The show was recorded, and later released as a live album. That month, the band released "A Doe to a Deer" as a free download on their website. The live recording of the Islington Assembly Hall show was released as A Good Night for a Fist Fight, the band's first live album, on 4 May. The band's first recording of 2013, "Little Mouth", appeared on the soundtrack for the independent film Benny & Jolene. Another song called "Allez Les Blues", which had previously been released as a Heat Rash-exclusive track, appeared on the Arts & Crafts: 2003–2013 compilation that April. In August 2013, the band released a teaser trailer for their fifth album, No Blues. The first single, "What Death Leaves Behind", was released as a free download through SoundCloud. This was followed on 8 October 2013 by a second single, "Avocado, Baby", with its music video directed by Craig Roberts. No Blues was released on 29 October 2013. The band released a six-song Christmas EP, A Los Campesinos! Christmas, on 8 December 2014. The band recorded their followup to No Blues throughout 2016. The group also added a new member, bassist Matt Campesinos!, that June. In November 2016, the band announced their sixth album, Sick Scenes, would be released on 24 February 2017. They also released the album's first single, "I Broke Up in Amarante" and announced their first North American tour in four years. They released the album's second single, "5 Flucloxacillin", on 16 January 2017. In 2018, the band announced that their first two albums would be remastered and reissued on vinyl on 12 October, with an additional disc featuring EP and non-album tracks. The band also announced that they would perform a concert in commemoration of both albums' tenth anniversary show on 13 October at the London Forum. When the band first emerged on the indie pop scene, they were pigeonholed with the 'twee pop' movement, as a result of their lively, joyous music. The band have worked hard since their 2008 debut, Hold On Now, Youngster, to shake this image. With their second recording, We Are Beautiful, We Are Doomed, critics generally applauded the band for adopting a new, darker guise. This continued through their following two albums, though whilst expanding the band's instrumental sounds. As a band, they have before claimed to be heavily influenced by Pavement, Modest Mouse, Guided By Voices, Blur, The Beautiful South, Xiu Xiu, Broken Social Scene, Built To Spill, Yo La Tengo, Sonic Youth, Pulp, Belle & Sebastian, The Magnetic Fields, Joy Division and The Smiths, amongst others. They also cite the literature of B.S. Johnson, obsessions with death, and football as their non-musical influences. Gareth has cited Paul Heaton, the frontman of The Housemartins and The Beautiful South, as his biggest influence as a songwriter. He told Stereogum, "It’s safe to say, if it were not for Paul Heaton, I would never have wanted to write lyrics." "Don’t Tell Me to Do the Math(s)"
2008 "Death to Los Campesinos!" 2009 "The Sea Is a Good Place to Think of the Future"
"Kindle a Flame in Her Heart"
2012 "Songs About Your Girlfriend"
"Tiptoe Through the True Bits"
"A Doe to a Deer"
2013 "What Death Leaves Behind"
2016 "I Broke Up in Amarante"
2017 "The Fall of Home"
Heat Rash #1 (April 2011): "Light Leaves, Dark Sees" b/w "Four Seasons"
Heat Rash #3 (June 2012): "Allez Les Blues" b/w "Dumb Luck"
Heat Rash #4 (November 2012): "She Crows" b/w "To the Boneyard"
You Say Party – "Laura Palmer’s Prom"
Parenthetical Girls - "Sympathy for Spastics"
^ "Gareth Campesinos of Los Campesinos!". ^ Garland, Emma. "Los Campesinos! Rank Their First Five—Yes, There Were Five—Records - Noisey". Noisey. Retrieved 9 March 2017. ^ "Los Campesinos! (albums)". Discogs. Retrieved 18 January 2016. ^ a b Bennett, Nichole (17 January 2009). "The Awkward Off Vs. Los Campesinos!". The Awkward Off. Archived from the original on 9 November 2013. ^ "BBC Wales: Los Campesinos! biography". 21 June 2007. Retrieved 12 October 2008. ^ "Los Campesinos! sign to Wichita". Drowned in Sound. 23 November 2006. Retrieved 18 February 2010. ^ "Arts&Crafts Sign Los Campesinos!". Spacelab Music News. 25 April 2007. Retrieved 18 February 2010. ^ Hogan, Marc (21 February 2008). "Los Campesinos! : Hold on Now, Youngster... Album Review". Pitchfork. Retrieved 6 November 2016. ^ "Studio". 19 March 2009. Retrieved 26 March 2009. ^ "Nota bene". Los Campesinos!. Archived from the original on 11 June 2009. Retrieved 2 June 2009. ^ "Don't tell Los Campesinos! that the glockenspiel isn't fierce". ^ Kim Campesinos! and ‘There Are Listed Buildings’ Archived 26 September 2009 at the Wayback Machine, LosCampesinos.com, 21 September 2009. ^ "Watch This Adorable Los Campesinos Feature and Performance from Last Call With Carson Daly – The L Magazine". The L Magazine. ^ Skiddle. Los Campesinos Interview: "We Didn’t Even Think We Would Gig Outside of Wales." 2011. ^ The 405 (21 January 2012). "Los Campesinos! perform 'By Your Hand' on Letterman Show". The 405. Retrieved 6 November 2016. ^ NME.COM. "Los Campesinos! : 'There's no point in bands like us releasing singles'". NME.COM. ^ "Ellen: It's Been an Awfully Big Adventure". Archived from the original on 10 December 2012. Retrieved 7 December 2012. ^ "Los Campesinos! on Twitter". Twitter. ^ "Blog Archive » 'A Doe To A Deer' (FREE DOWNLOAD)". Los Campesinos!. 12 December 2012. Archived from the original on 5 October 2013. Retrieved 24 July 2013. ^ "Pitchfork: Los Campesinos! Announce New Live Album". Retrieved 24 April 2013. ^ "Los Campesinos! Facebook Update – Little Mouth". Retrieved 16 June 2013. ^ "Arts & Crafts: 2003–2013 Allmusic review". Retrieved 19 July 2013. ^ "Los Campesinos! No Blues trailer". Retrieved 21 August 2013. ^ Los Campesinos!. "What Death Leaves Behind by Los Campesinos! on SoundCloud – Hear the world's sounds". SoundCloud. Retrieved 7 October 2013. ^ Connick, Tom. "What's going on with... Los Campesinos!?". DIY Mag. Retrieved 4 November 2016. ^ a b c Sodomsky, Sam. "Los Campesinos! Announce New Album Sick Scenes, Share New Track: Listen | Pitchfork". pitchfork.com. Retrieved 10 November 2016. ^ "5 Flucloxacillin by Los Campesinos!". Soundcloud. ^ a b Kim, Michelle. "Los Campesinos! Reissuing First 2 Albums | Pitchfork". pitchfork.com. Retrieved 1 July 2018. ^ "On Hello Sadness, Los Campesinos! shed their 'twee'". National Post. Retrieved 6 November 2016. ^ a b Rich Hughes. "Los Campesinos! :: The 12 Records that Influenced Romance Is Boring". The Line of Best Fit. ^ "Los Campesinos! – "I Love You (But You're Boring)" (The Beautiful South Cover)". Stereogum. 11 June 2012. Retrieved 21 February 2018. ^ "Los Campesinos - UK Album Charts". Official Charts Company. Retrieved 1 March 2017. ^ "Discografie Los Campesinos!". ultratop.be. Retrieved 6 January 2017. Hold On Now Youngster: "2008-03-02 Top 100 Scottish Albums Archive". Official Charts Company. officialcharts.com/. Sick Scenes: "2017-03-03 Top 100 Scottish Albums Archive". Official Charts Company. officialcharts.com/. ^ Billboard – Independent Albums – Los Campesinos! ^ Billboard – Rock Albums – Los Campesinos! "The International Tweexcore Underground": "Official Scottish Singles Chart Top 100 - 2007-10-28". Official Charts Company. "Death to Los Campesinos! ": "Official Scottish Singles Chart Top 100 - 2008-02-24". Official Charts Company. ^ "Los Campesinos on Music VF.com". MusicVF.com. Retrieved 2 June 2016. Wikimedia Commons has media related to Los Campesinos!. "The Sea Is a Good Place to Think of the Future"
This page was last edited on 20 December 2018, at 02:16 (UTC).